A Simple Side dish to Kick Things Off! take up SO much time! And general craziness like quitting my job and becoming self-employed is a tad distracting! I also switched from using Windows (my whole life!) to a new MacBook. Learning curve? YES!! I have had to relearn so many commands and programs…that may have kept me away from here too, now that I think about it. Just trying to find a way to resize pics and NOT use iPhoto….grrrrr….anyway, let’s avoid that topic, shall we? 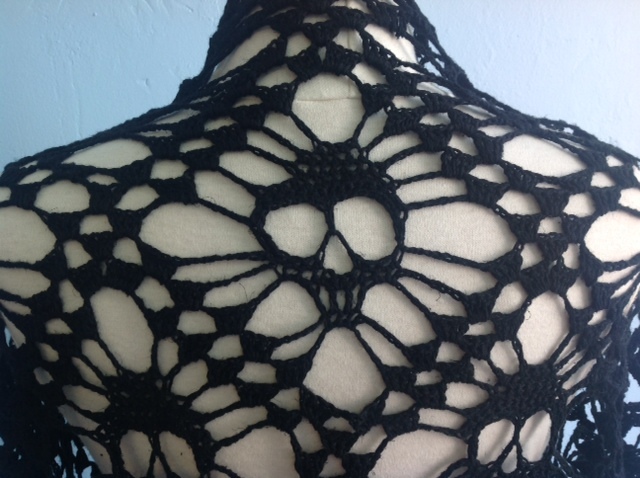 Anyway…so busy, crazy, and happy…thus time passed and here I am, ready to share with those readers who are still checking this blog, an awesome side dish! Awesome, that is, if you like mushrooms. 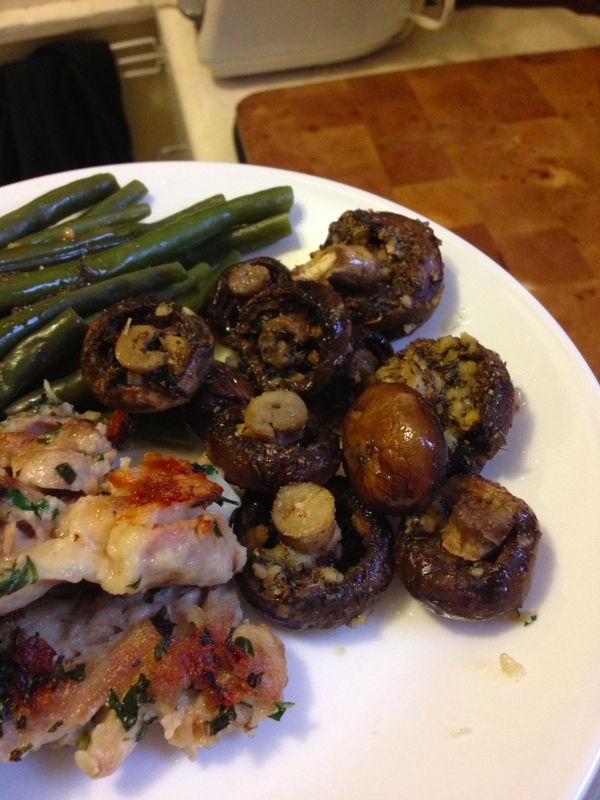 We had a bowl of mushrooms in the kitchen and they were getting to the point that they had to be eaten, or allowed to return to the wild and spore, so I fried and baked them as a side to a chicken dish and they were delicious! 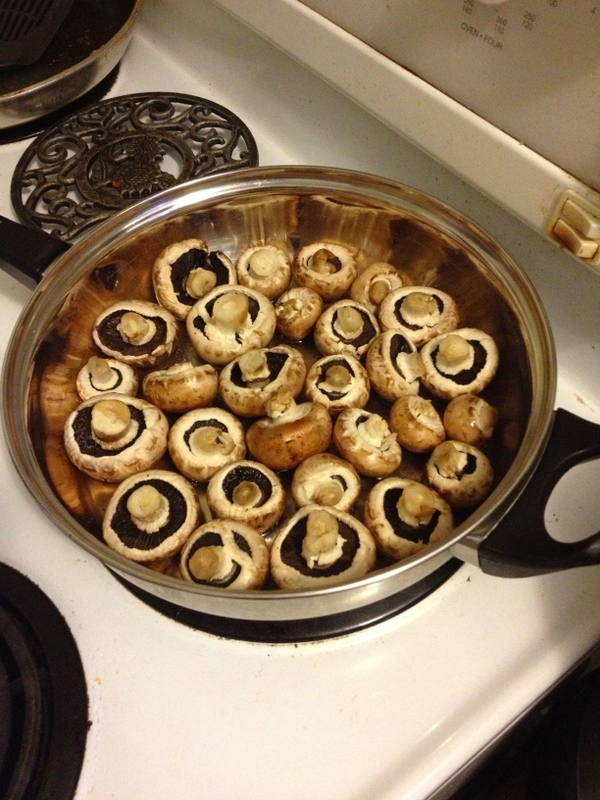 Remove the mushrooms from the pan and place them into an oven friendly dish, again, caps down. Spoon the mixture overtop so that each mushroom has some sauce and then sprinkle some breadcrumbs to add some crispiness to the finished product. 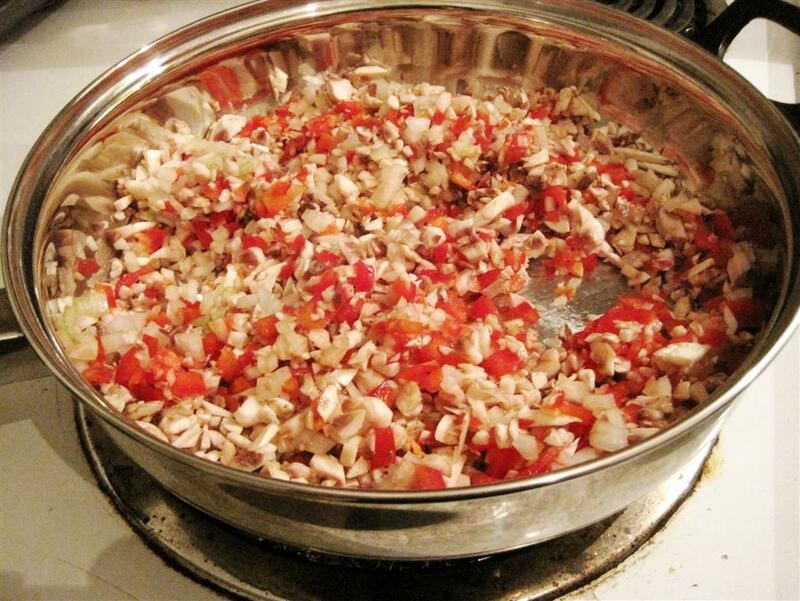 Put the pan in a pre-heated 400 degree oven for 10 minutes and you’ll have a brilliant side dish to add to your meal! 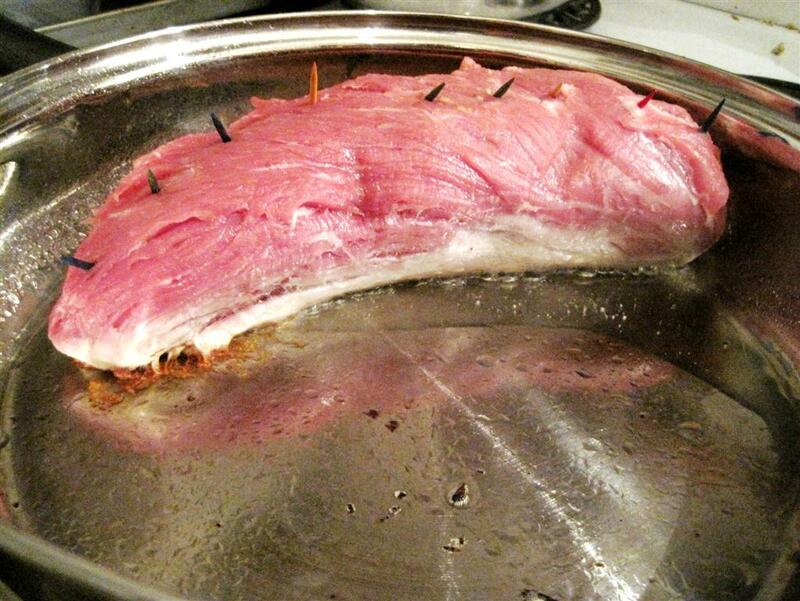 Let me start this post by clarifying that I LOVE pork tenderloin. 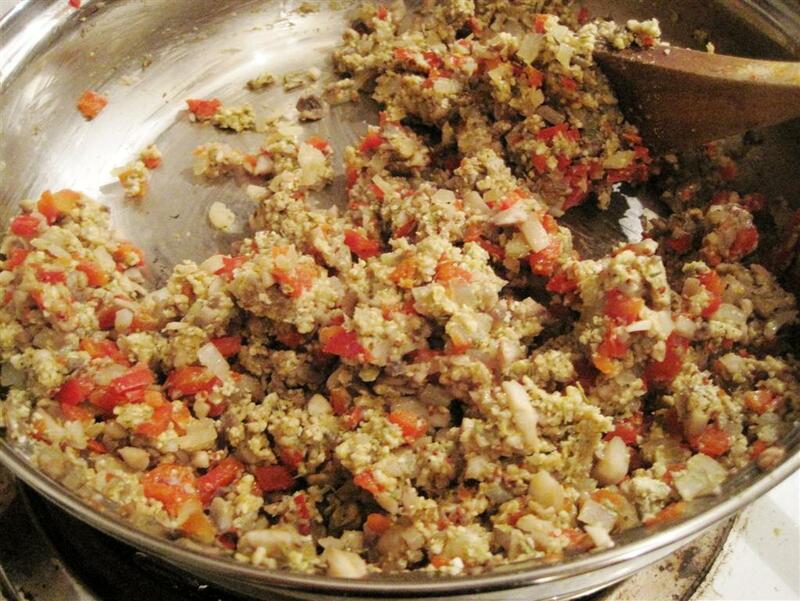 It’s the stuffing in this recipe that I didn’t care for and so now I know that I’m not a big fan of savoury. At least, I think it was the savoury that caused my tastebuds to recoil. It might have been the sage…or the mix of the two…but somehow I believe it was the savoury. 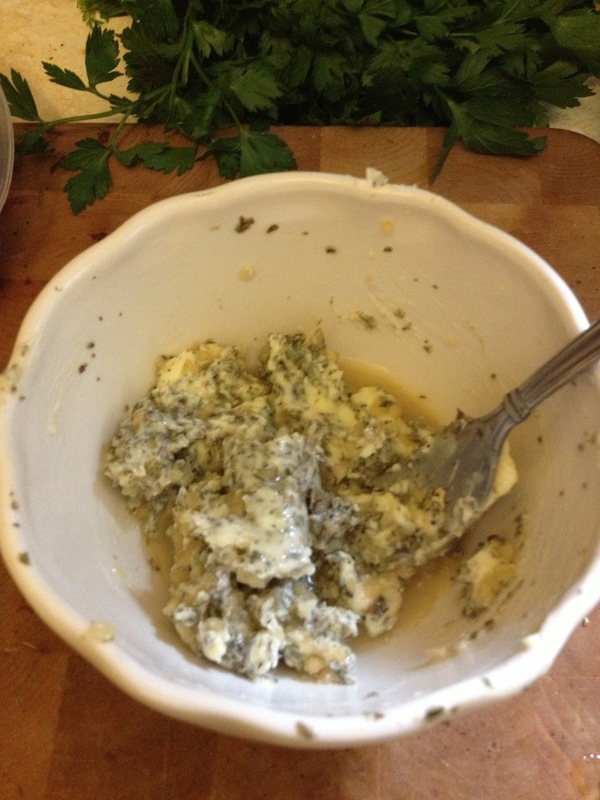 I’ve never been a big fan of rosemary either and the savoury brought back rosemary-ish memories…so there you have it. I also have to apologize for the pictures. I took them somewhat haphazardly during the cooking process so the composition is questionable and … well, the tenderloins just look…..
*mutter mutter* I just hope WordPress doesn’t have a strict “No Dirty *Looking* Photos” policy. 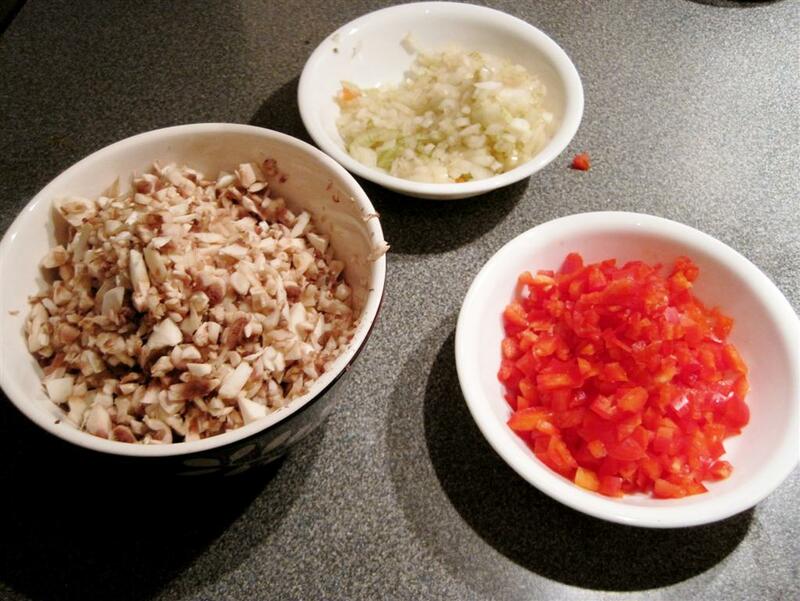 So to begin, you prep your onions, red pepper and mushrooms. Pretty straightforward…and then you saute them…. I know that mushrooms contain a lot of water but I wondered if I’d be able to tell when they were ready. Yep, it was pretty obvious. 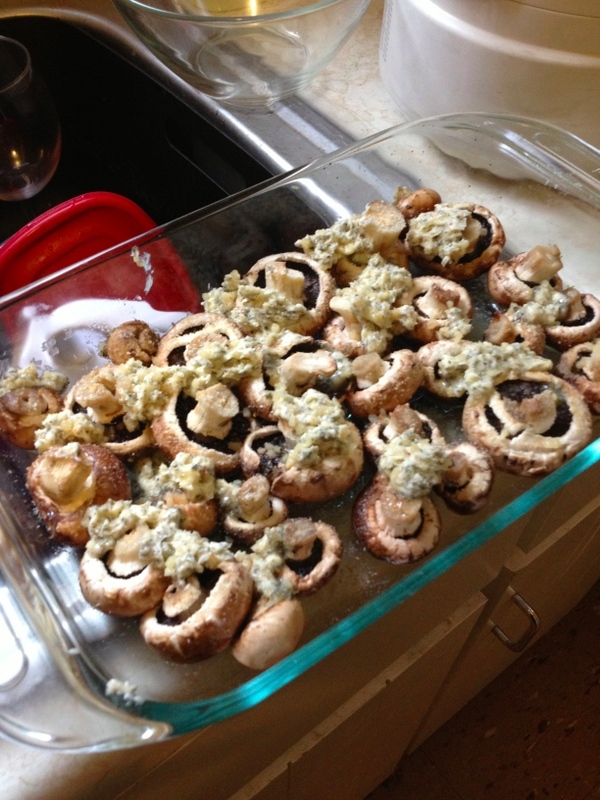 Sort of as though the mushrooms had held it for so long that a little warmth…and voila! Moisture! (Yeah, there’s a pee joke in there somewhere!) It happens in the blink of an eye (doesn’t it always!) so watch for it and be prepared! 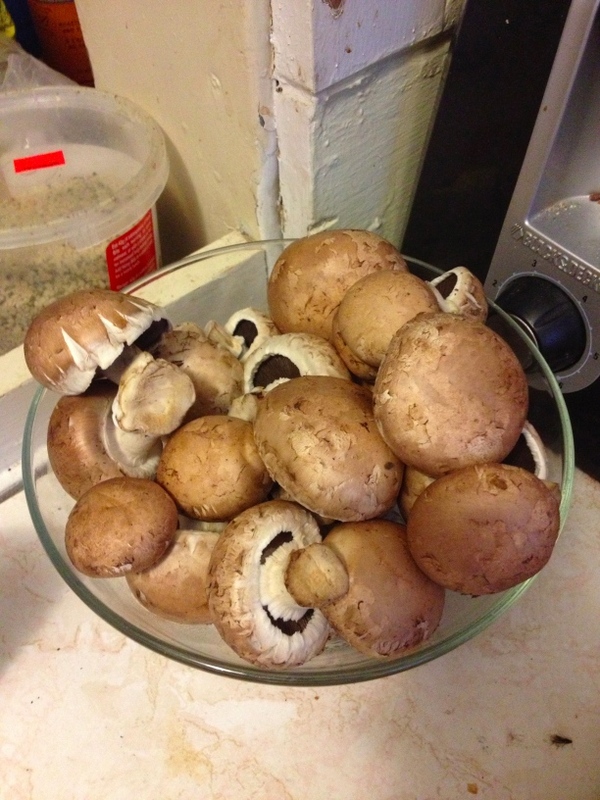 Once your mushrooms have relieved themselves…add your savoury, sage, salt and pepper…stir and saute a bit longer…followed by removing it from heat and adding of mustard and bread crumbs. 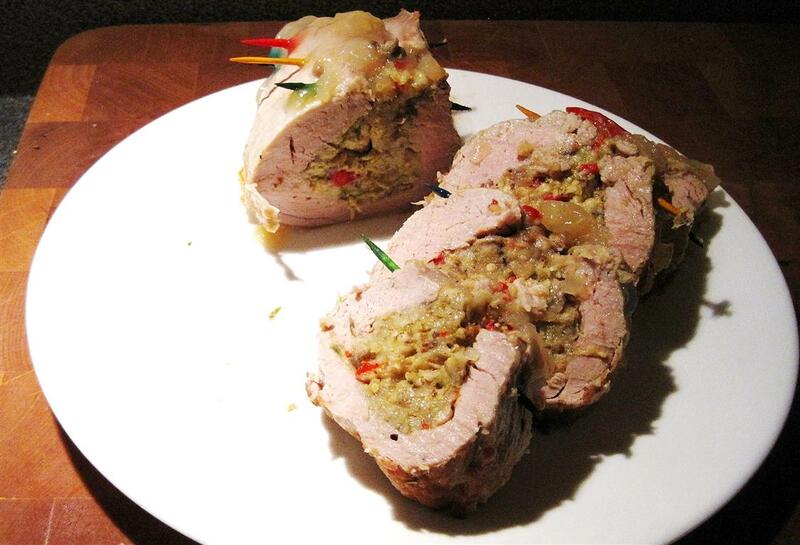 Now that your stuffing is prepped…it’s time for some fun!! Breaking out my new toy! 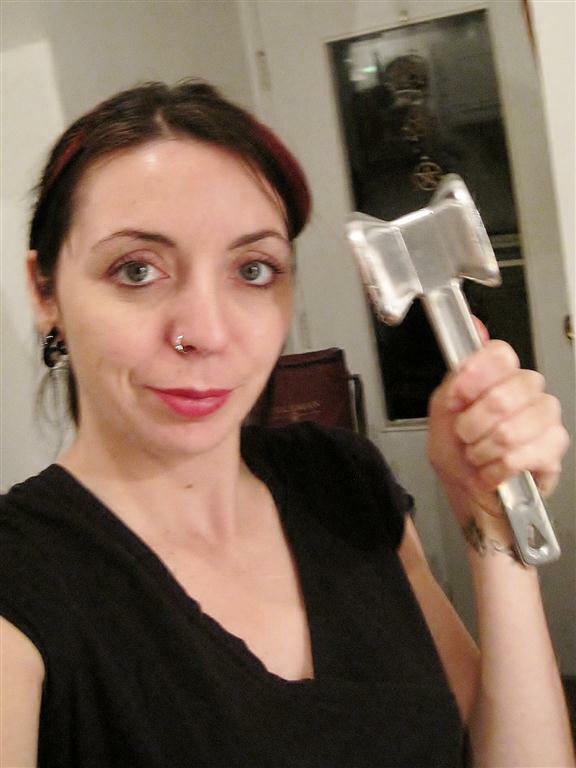 I took a few pictures of me and my new kitchen toy…but they were all blurred, or just ridiculous 😉 That was the best of the bunch. 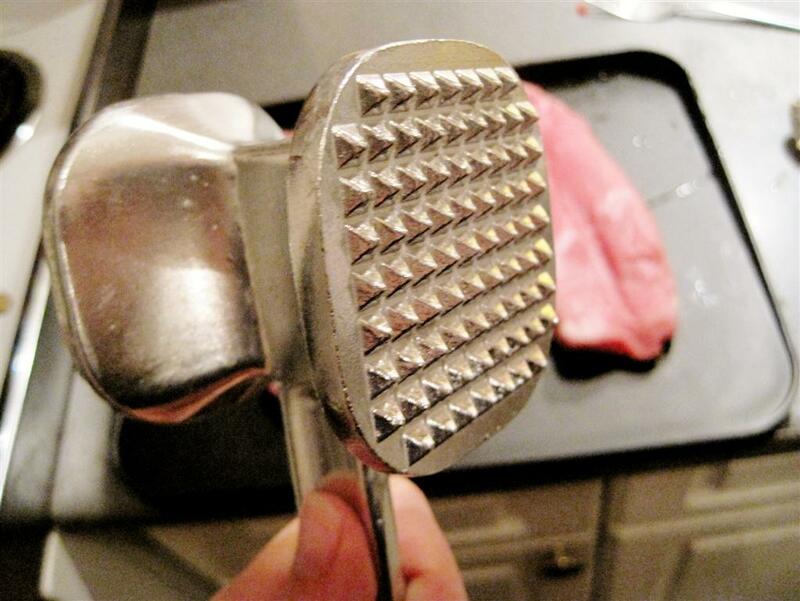 Slice your tenderloins 3/4 of the way through, open them up and smash them! 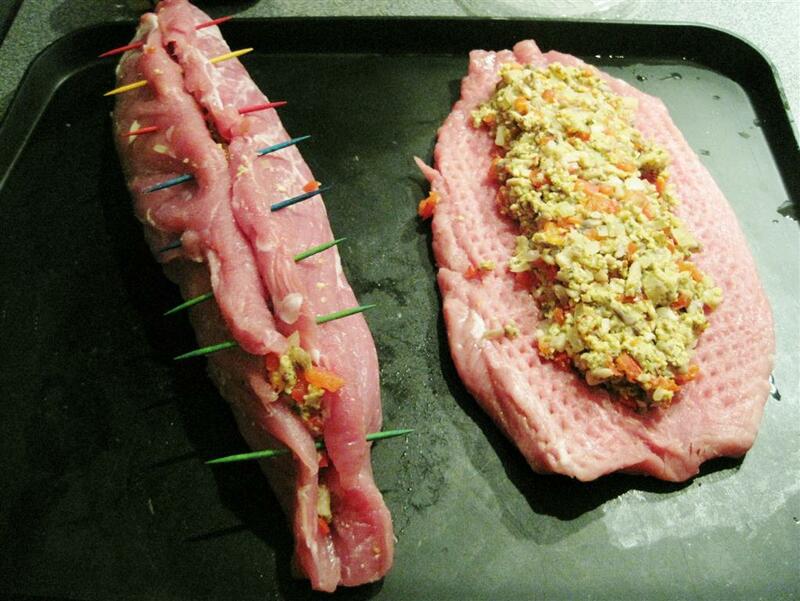 Once stuffed and skewered/closed/toothpicked…sear both sides in a hot frying pan. Once seared…time for the oven to do its work! 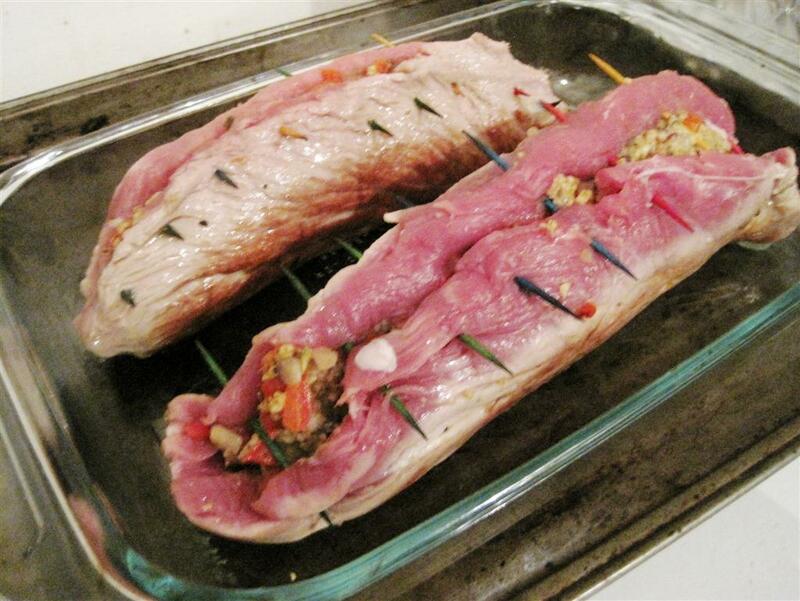 Transfer them to a roasting pan and roast them for 20-25 minutes. 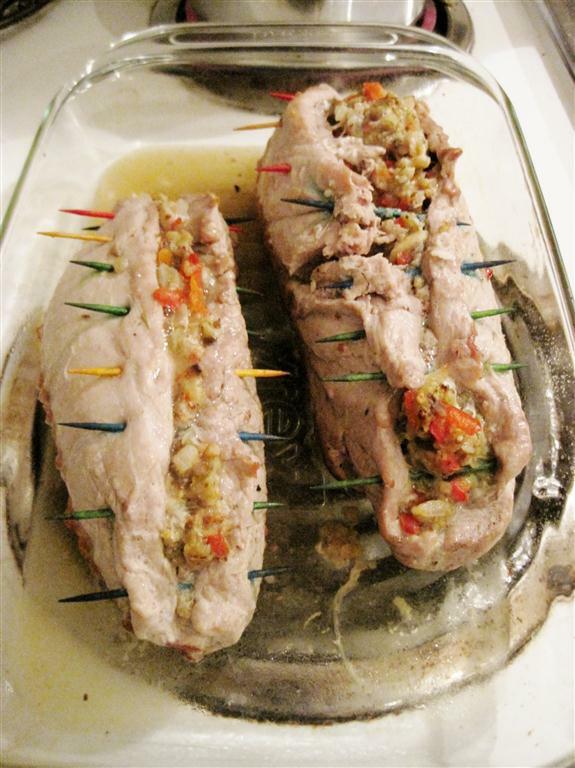 In a short time, you have two lovely stuffed pork tenderloins to serve! With regards to the closing/skewering/tying/toothpicking closed…coloured toothpicks? Not your friend. Well, mainly the blue and the red ones…which weeped all over the meal. Green seemed okay. *wink* This is a picture just out of the oven…the colour began running down the sides as they cooled. Oops! This recipe was actually incredibly easy and fast. Add a few side dishes and you have yourself a beautiful meal! 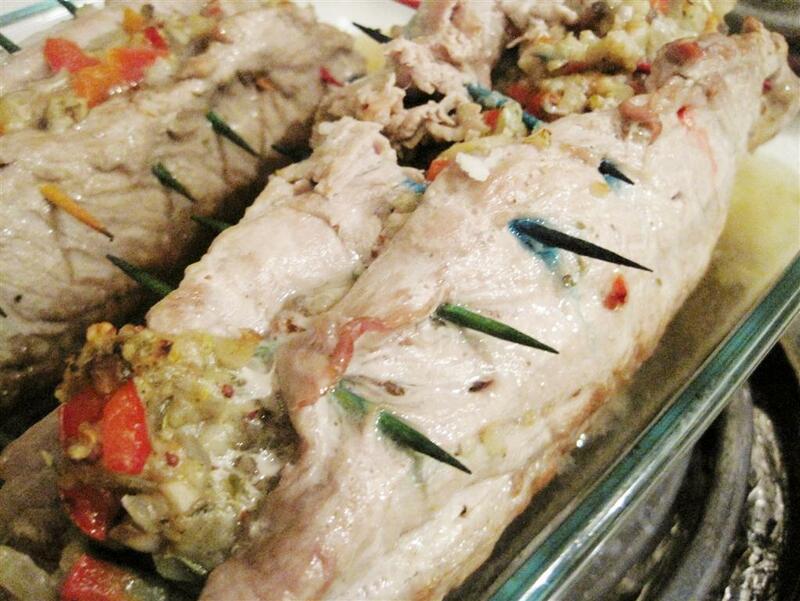 Although I have admitted that the stuffing wasn’t to my taste, my dinner guests loved the pork so I have to assume it was a my-tastebuds-against-theirs type situation. The pork smelled heavenly and with a few herb tweaks, I’m sure I’d find it awesome as well! NOTE: I also made the apple drizzle, which you will find detailed below. It was a great addition to the dish…a bit of sweet to partner the savoury. I highly recommend including it! In med skillet, heat 1 tbsp oil over med/high heat. 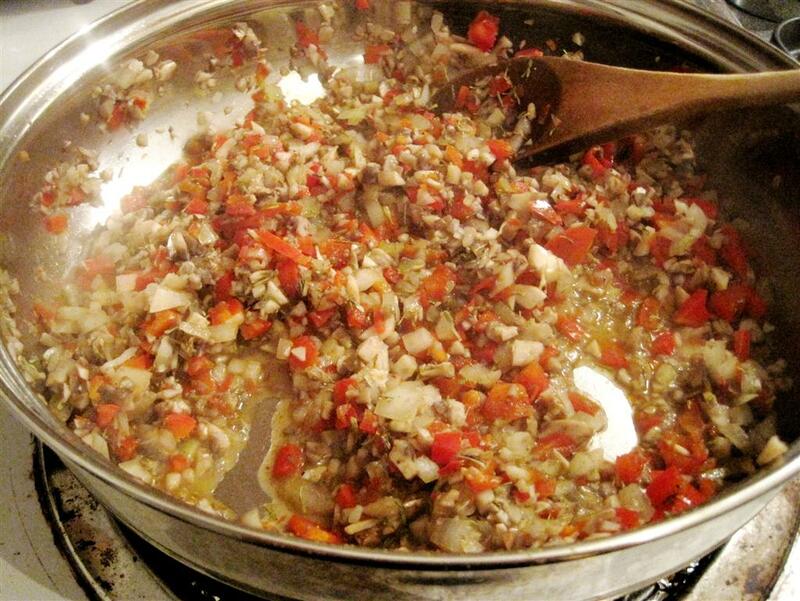 Saute mushrooms, red pepper and onion for approx 3-4 minutes…until moisture is released from mushrooms. Add savoury, sage, salt and pepper. Saute for 1 minute. Remove from heat. Stir in mustard and bread crumbs. 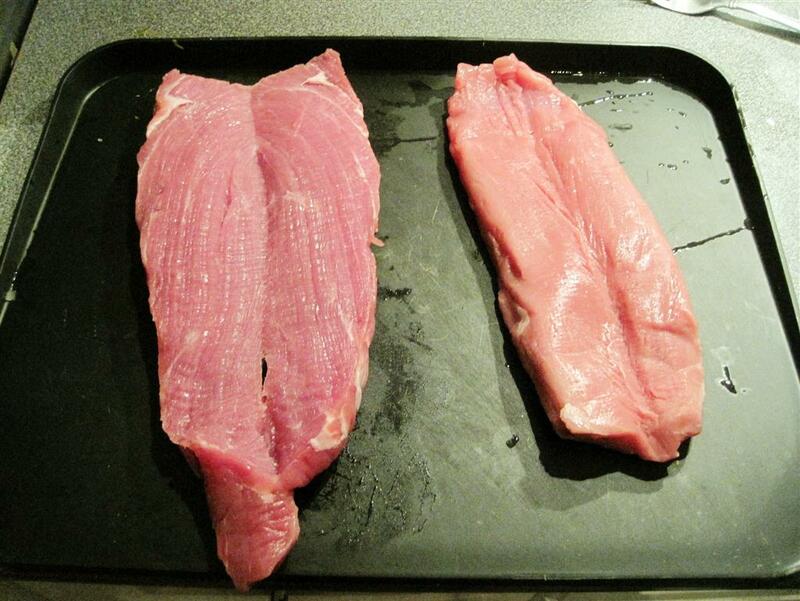 Cut tenderloins almost in half lengthwise so it opens like a book. Pound to flatten slightly if you wish. Lightly pack stuffing down the centre of each tenderloin, leaving 1-inch border around the edges. 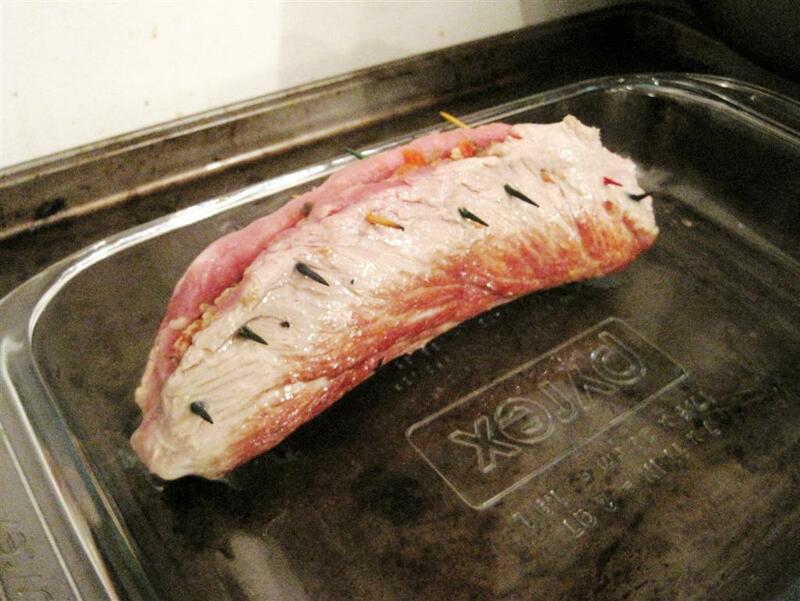 Fold tenderloins closed, secure with skewers or string. Heat remaining oil in a skillet over med/high heat. Sear both sides of the tenderloins for about 5 minutes. Let stand covered with foil for 5-10 min, slice and fan out on serving plate. In a small pan, mix 1 cup apple juice with 1 tbsp corn starch until smooth. Bring to a boil, stirring constantly and boil 1-2 min until thickened and clear. Stir in pan juices and drizzle over tenderloin.